Nowadays, we consider that more than 50% of the value coming from commercialized African forest production’s is destined to China. The current and future impact on the Congo Basin’s forests is potentially high. The strategy for the future of Chinese companies is still uncertain, because of their low interest for certification, and the heterogeneity regarding the companies’ purchasing policy (big companies have a serious “sustainable management” approach, but small companies that sometimes work outside the perimeter of managed concessions, have mediocre reputation). 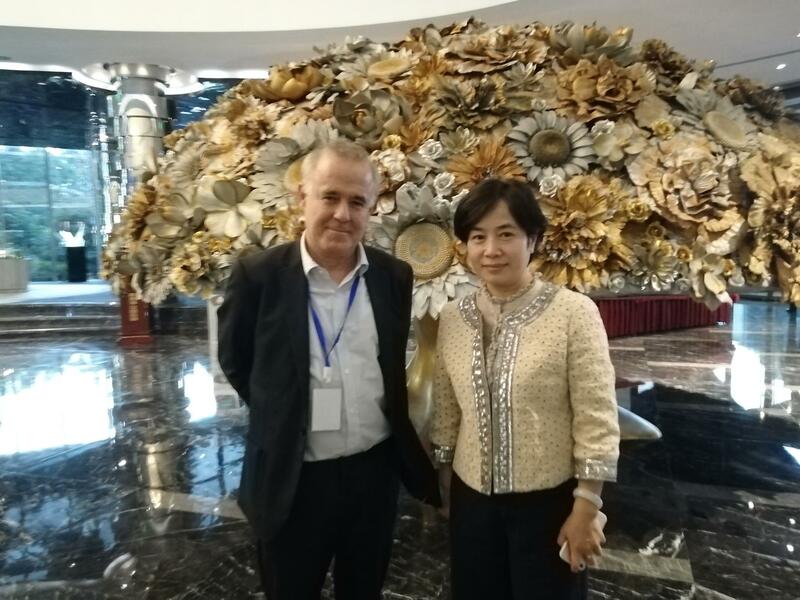 Also, the general manager of ATIBT, Benoit Jobbé-Duval, was in China from the 7th to 16th of November 2018, to establish a relationship with the Administration and Chinese importers, and to talk about the future of sustainable management of Central Africa’s forests. This first contact was facilitated by Ralph Rider, advisor to the Chinese National Forestry and Grassland Administration (NFGA, previously SFA). In its driving role dedicated to the sustainable management of tropical forests, the Association had to establish a direct contact with the main importers in China, to understand their strategy, and try to associate them to a better resource’s sustainable management policy, despite the current difficult context of certification regression and European-owned companies, who have been the actors of this sustainable management until now. This first contact with the Chinese actors of forest management in Africa, and with the Chinese buyers, was considered crucial when the 1st ATIBT Think Tank took place, in May 2018. In the days that preceded this visit, a presentation of the Fair&Precious program was made to the ITTO, in Japan, as part of the “Discussion Market” on the 6th of November 2018. This visit to the ITTO helped to understand that this organisation has already been strongly working with China for the past 12 months, on the matter of the sustainable management of tropical forests. Regarding this trip, it was important to introduce the role of the ATIBT, and associate Chinese organisations and companies that share our values, so we can establish a network for the future, and to establish the bases for the organisation of an ATIBT Forum in China, in 2019. During this trip, we tried to identify other projects or actions undertaken in China for the forests’ sustainable management. Among these initiatives, there is the GGSC project (Global Green Supply Chain), led by Chinese entities and ITTO, and managed by Dr Luo Xinjian, from the CAF (Chinese Academy of Forestry). It’s about a new plan to implement a sustainable purchasing policy for the Chinese forest sector. The GGSC currently gathers the CAF (Chinese Academy of Forestry), the ITTO, and the most important professional Chinese entities, the CTWPDA (Chinese Timber Wood Products Distribution Association), CFPIA (Chinese Forest Products Industry Association), STTA (Shanghai Timber Trade Association) and research organisations. The ATIBT and the GGSC are, of course, going to keep communicating in the next months. Moreover, ATIBT has been invited by the CTWPDA (Chinese Timber Wood Products Distribution Association), to attend two conferences. ATIBT made two speeches, on the occasion of the Hardwood Conference (7th of November) and the Wood Flooring Conference (8th of November), both organised by the CTWPDA. Each conference gathered between 200 and 300 people. A Chinese trip from the GGSC will take place on January 2019 to the Congo Basin’s countries. It will certainly be a very good occasion to deepen the discussions between the companies concerned by the sustainable management of Central Africa’s tropical forests. ATIBT is extremely pleased to have established promising links with these important Chinese institutions , and will of course follow all future opportunities in order to continue joint reflections on the sustainable management of tropical forests.